What has been included here is information from current and former members. If you are a past member or player and wish to add a chapter to our history, please contact Paul Godden or send an email to president@sturtbadmintonclub.org.au. 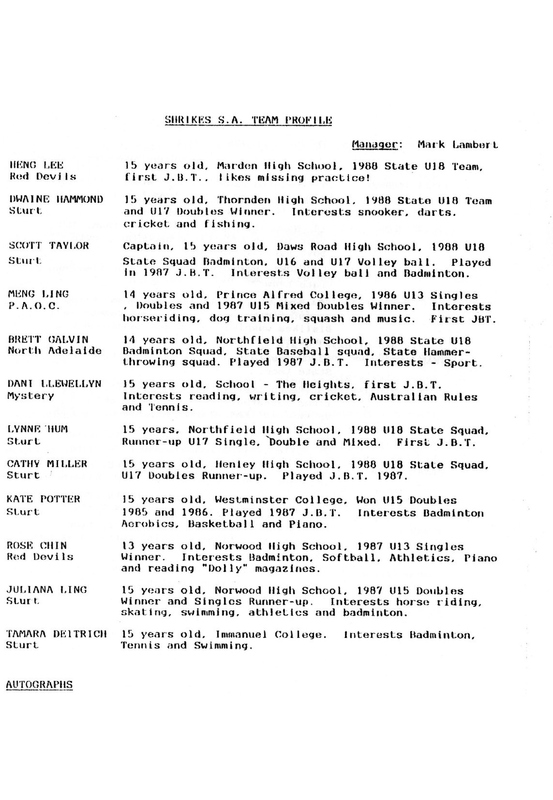 The Sturt Badminton Club ('Sturt') was founded in Adelaide in 1981 by Jeff Stokes. His aim was to build a club with a focus on junior development and to influence the number of secondary school students at Year 10 and above who were being introduced to badminton. At that time there were like-minded teachers at Blackwood High School and Daws Road High School (now called Pasadena High School) who promoted our club to their students, helping our club grow. Jeff's philosophy was, and still is, to teach badminton skills during school years so that the person can play immediately, or at any time in the future. This founding principle of junior development continues to drive the club today. In the first year, Sturt entered one team in the South Australian Badminton Association (SABA) competition and the team members were John Woolford, Jeff Stokes, Bob Potter, Wendy Purdie and Maureen Collins. These players had played the year before as 'Upper Sturt' with Gerry and Shirley Wrightson. Jeff Stokes was our first President and stayed in that position until 1990. He was also involved with the Board of the South Australian Badminton Association, and played a significant part in SABA moving from a Council to a Board structure. Today, Sturt has grown to over 100 members and attempts to place all interested players into a competitive team in the SABA grade competition. While the number of teams fluctuates, Sturt now consistently enters the highest number of teams across all grades in that competition. Sturt entered 15 teams in the 2013 SABA winter season competition. After much hard work fine-tuning the constitution, and a vote of acceptance by the members, the club became an incorporated association on 22nd July 1987. One highlight of the club's history and of Jeff's Presidency was the successful bid to host the June Bevan Trophy tournament in 1988. Sturt was the first and only club in South Australia to host this major Under 16 event. Jeff was involved in managing the State juniors and had the idea after taking teams away to the events held in Ballarat in 1986 and New Zealand in 1987. The 1988 event was held at The Parks Community Centre at Angle Park, Adelaide. Teams entered from all over Australia and New Zealand. Prior to the event Sturt had intended to enter one team but Jeff, at short notice, put together a second Sturt team to even up the draw. Hosting this Australasian event was a major achievement for one club and has not been repeated. 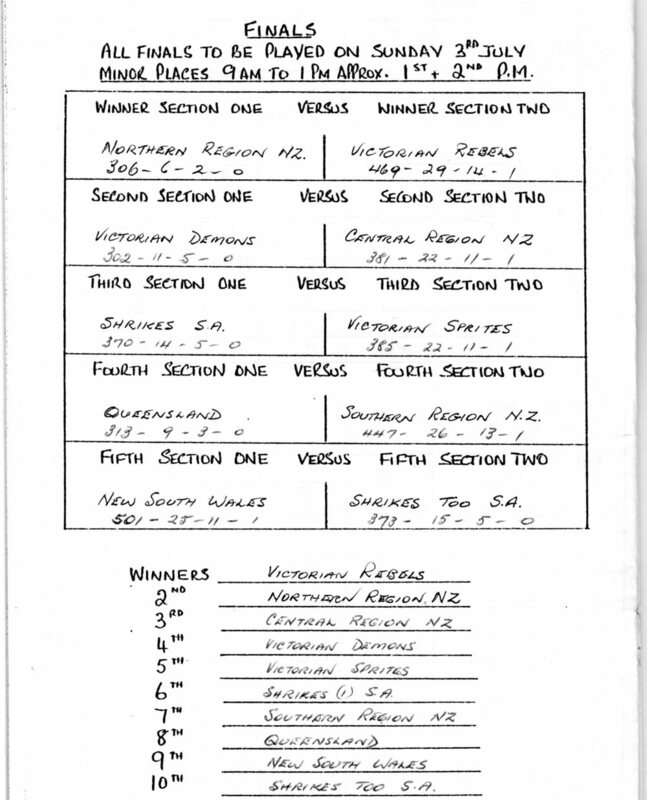 There was a lot to organise and many people assisted: programs were typed, team shirts were organised, interstate and overseas teams were billeted, Val Nesbitt entered results, Greg Hobba set up a temporary pro shop, there was a canteen, the Commonwealth Bank agreed to sponsor the event, there was media coverage and the local Member of Parliament presented awards. The event was won by the Victorian Rebels with the Shrikes S.A. team finishing sixth and Shrikes Too S.A. finishing tenth. Sturt is extremely proud to have run this successful event. Sturt's logo was designed by club member George Hum. Our first Double Blue Newsletter (the paper version!) was released around 1990. In 2011 Sturt proudly celebrated its 30th anniversary. Sturt is particularly proud of our role in the early careers of Olympians Kate-Wilson Smith and Leanne Choo. We like to think that we nurtured their skills and provided support for them and their families on the journey to Kate and Leanne becoming elite athletes at Olympic and Commonwealth Games level. Sturt is also about having fun. Not everyone wants to or is able to commit to playing in a team competition, and for those people Sturt offers Friday night training with a social focus. Sturt also arranges social events available for all our members to attend if they wish. The club has arranged social ten-pin bowling days, held summer barbecues and picnics, organised a dolphin sightseeing cruise, and arranges presentation lunches and dinners. Sturt has operated training sessions at various venues: Glenunga High School, Urrbrae Agricultural High School, Brighton Secondary School and then Seymour College. In 2016 the Club moved its Friday night home to Loreto College 316 Portrush Rd, Marryatville, Adelaide, South Australia to run its Sturt Badminton Academy and social games. Sturt's Saturday night Adelaide Badminton Academy training sessions are held at Satterly Hall Lockleys. Tournaments organised by the club are run at either WA Satterley Hall, 42 Rutland Avenue, Lockleys, or at Loreto College. Life Membership is awarded to dedicated people who have made an outstanding contribution to the Sturt Badminton Club..